Day 2 of my personal 100 days in my clothes project. I wore this shoes today. Not because I wanted to wear them but because I needed to swap out my "back up office shoes". Back up office shoes are the shoes that I keep under my desk in the office for any unexpected emergencies in the footwear department. The emergency could be anything ranging from the shoe I'm wearing suddenly loses a sole to the shoe du jour becoming unbearably uncomfortable as the day wears on. (Both situations may have occurred more than once). When this happens, I switch to the back up shoes. 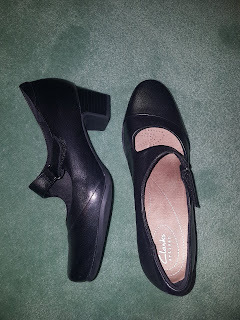 Because I can't predict what I'll be wearing, my back up shoes have to be in a color and style that would be suitable to pair with any outfit I may be wearing. Here are the shoes to fit the bill! They're mary janes from the Clarks brand. Comfortable but clunky. Ugly but useful. I don't like them but they have a place in my closet. I wouldn't want any of my regular favorites to be relegated to the corner under my desk so these little pumps are taking one for the team. PS: If you're thinking they look rather unworn, yes they do. My shoe emergencies are few and far between.